SoftPlanet makes it possible for everyone to get free K7 Antivirus Plus download directly from our servers. There is no registration needed for downloading. Surfing the Web is fun and most of the time you spend a lot of time browsing hundreds of websites. Doing it without strong protection from malware is a risky task. 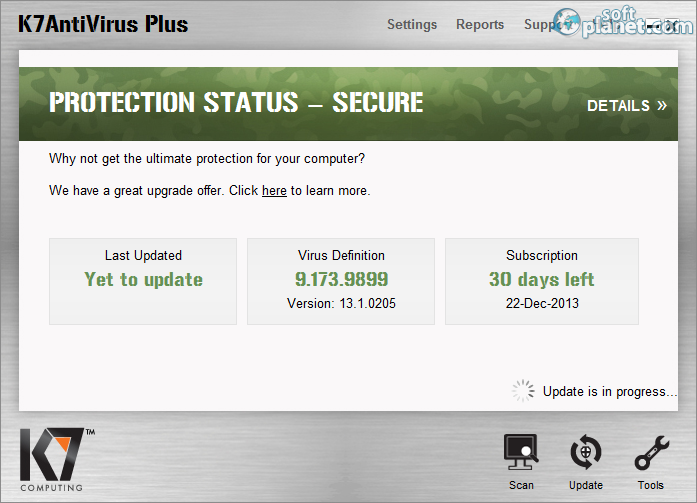 K7 Antivirus Plus 13.1.0.205 can provide you with such and at the same time will not slow down your PC unnecessarily. Similar to its more famous threat guards, this application is not free. However, a 30-day trial version can be downloaded and evaluated absolutely free of charge and without any functional limitations. K7 Antivirus Plus provides excellent real-time protection against viruses, worms, trojans and just about any malware that may attack your PC, emails or external drives. It is also equipped with a very fast scanner which has five scan modes, it can be scheduled and it can even check your computer for abnormal changes made to critical system settings. Additional utilities are included with this pack for USB vaccination, Internet and Windows temp cleaning and a Virtual keyboard too. Most antivirus program users preferred the work with these applications to be reduced to a minimum. K7 Antivirus Plus is such one and anyone can tell that right away. If you take a look at the program interface you will see a very clean and stylish window with several menus on top and three buttons at the bottom. The middle of the home program screen is used for information about the last performed update, the virus definition version and the program license. If you click on Details another screen will show up and there you can turn on or off any of the five listed program features. Clicking on the Scan button will show you all the possible scanning options and all possible settings that you can make before you launch any of the scan modes. Of course you can scan your PC on a schedule which can automate some of the tasks that you usually do on a daily basis. K7 Antivirus Plus offers additional utilities and various reports which only complete the list of features the program offers. A built-in help file can be used at any time to explain all possible aspects related to the program functions, features and options. Definition updates are done automatically so you don't have to worry about that. Many other program settings can be set in a different way so to satisfy the requirements of any user. The developers of K7 Antivirus Plus 13.1.0.205 have put a lot of effort to create this powerful and at the same time strong protection software which can be your ultimate shield against viruses, malware and all kinds of threats. Give it a try and decide if it is the right product for you. 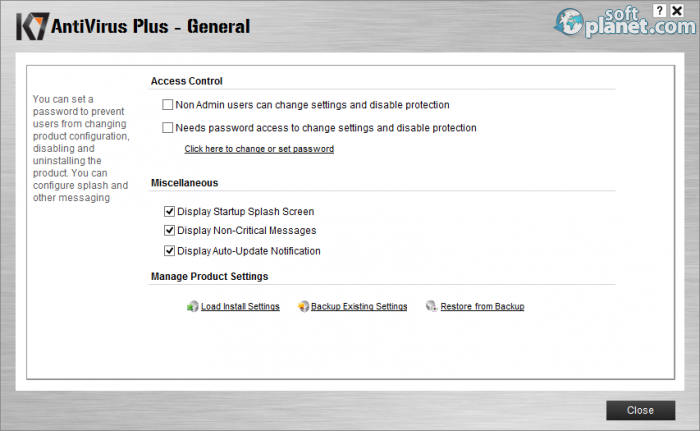 K7 Antivirus Plus is VIRUS-FREE! 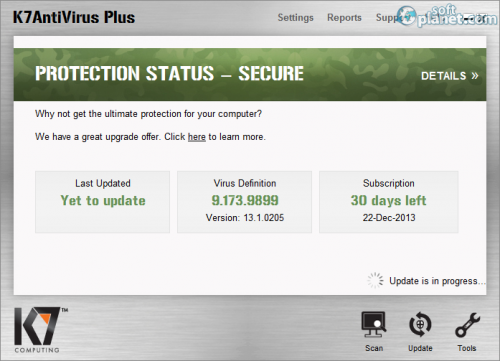 Our security scan shows that K7 Antivirus Plus is clean from viruses. The current version of K7 Antivirus Plus has been scanned by our system, which contains 46 different anti-virus algorithms. That ensures that K7 Antivirus Plus 13.1.0.205 is 100% safe for your computer.